'From savings to investments' has been a government slogan since the late 1990s, expressing its policy to increase Japanese household investment in financial assets. Historically, this policy has had limited success. However, Japanese household assets represent a reported ¥1,800 trillion at the end of 2017, and encouraging the investment of those assets in growing businesses is one of the most important policies of the 'third arrow' of the Abe government's growth strategy. Investment funds in particular are considered to be an important measure of the success of this investment drive by the Financial Services Agency of Japan (FSA).2 Thanks to the remarkable performance of Japanese listed companies under a relaxed monetary policy and a depreciated yen, the Nikkei average has more than doubled since the Abe government came into power in 2012, and investments made by Japanese households have witnessed impressive gains in the equity markets. The total net assets held by Japanese domestic investment funds for public offer reached a historical high of ¥100 trillion in May 2015 and was at ¥111.5 trillion in April 2018. However, the total net assets held by Japanese domestic investment funds for public offer is only about 5.9 per cent of the total value of Japanese household assets.3 Accordingly, there is room to increase the assets that investment trusts are managing. The FSA is likely to continue to push toward 'upgrading the asset management capacity' of individual financial institutions, and review whether financial institutions, under their customer-oriented policy, are providing financial products and services that are genuinely beneficial to customers. In its Strategic Directions and Priorities 2017–2018, the FSA has declared that in analysing policy issues, it puts emphasis on whether the flow of funds is at the optimum throughout the economy (including the cycle of funds from households to the corporate sector via the capital market and banks) and how to achieve better equilibrium. Asset managers play a key role in allocating household funds to the corporate sector. Many Japanese asset management companies are subsidiaries of securities companies or banks that act as distributors of investment trusts that the asset management companies are managing, or financial holding companies, which are heavily influenced by securities companies or banks. Thus, asset management companies are often criticised as having a tendency to prioritise loyalty to their parent companies (i.e., distributors) rather than their fiduciary duty to their customers (i.e., investors). organise internal management systems, such as through compensation packages, to incentivise their employees to pursue the best interest of the customers. This is called a principle-based approach, where the regulator does not provide detailed rules and financial institutions are encouraged to compete with each other by adopting original measures to pursue best practice. As of 31 March 2018, 1,313 financial institutions, including asset management companies, securities companies, mega-banks, regional banks and insurance companies, have voluntarily adopted policies on customer-oriented business conduct. As another example of a customer-oriented policy, Japanese regulations regarding both Japanese investment trusts and foreign-domiciled investment trusts that are publicly offered in Japan were amended as of 1 December 2014 and require, inter alia, the manager or investment manager of a fund to manage risks relating to derivatives transactions in accordance with rules adopted in advance by that manager or investment manager. The new regulations also introduced credit risk management regulations, which came into effect on the same day. However, in respect of foreign-domiciled investment trusts, the credit risk management regulations have a grandfather period of five years, during which time the new regulations do not apply to foreign funds that were publicly offered in Japan prior to 1 December 2014 (see Section II.v). To further encourage investments, the government introduced the Nippon (Japan) individual savings account (NISA), a tax-exempt programme for small investments, in 2014. Under NISA, capital gains and income from investments in listed shares, publicly offered equity investment trusts, Japan real estate investment trusts (J-REITs) and exchange traded funds (ETFs) of up to ¥1.2 million per year are exempt from tax for up to five years. A savings-type NISA was introduced in 2018 in which capital gains and income from investments pursuant to a cumulative investment programme in certain publicly offered equity investment trusts and ETFs that satisfy stringent requirements (e.g., low-cost passive index funds) of up to ¥400,000 per year are exempt from tax for up to 20 years. Investors cannot use both an ordinary NISA and a savings-type NISA in the same year, so they must select which account they will use each year. In the area of global cooperation in asset management, Australia, Japan, Korea and New Zealand signed a memorandum of cooperation for the Asia Region Funds Passport (ARFP) in April 2016. The ARFP is an international initiative that facilitates the cross-border offering of eligible collective investment schemes, while ensuring investor protection in the economies participating in the ARFP. Participating economies were expected to implement the necessary domestic arrangements within 18 months of 30 June 2016,4 and Japan and Thailand completed their preparations as of April 2018. It is also worth noting that the FSA has listed concrete measures to monitor enhanced international cooperation under which it will participate more actively in discussions on international financial regulations, make its supervision more effective and efficient through enhanced cooperation with foreign authorities, and continue to upgrade its supervisory approaches with reference to those used by other regulators.5 This push towards cooperation with foreign authorities is likely to give the FSA access to more information on global asset management companies operating in Japan. 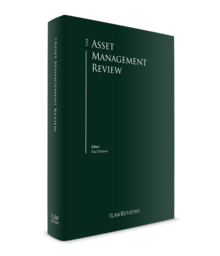 Japanese regulations on asset management vary depending on whether an asset manager has been delegated discretionary authority to manage a client's assets on the client's behalf, or whether the asset manager is simply able to provide investment advice. The provision of asset management services in Japan requires registration with the FSA, regardless of whether an asset manager has discretion to manage a client's assets on the client's behalf. Following the enactment of the Financial Instruments and Exchange Act of Japan (FIEA), which replaced the Securities And Exchange Act of Japan in 2007, activities of the general partner of a foreign limited partnership are regulated as asset management business, and in principle require registration under FIEA for the solicitation of investment in Japan (self-solicitation) and the management of the assets of the limited partnership (self-management). Certain exemptions from and exceptions to this registration requirement are available. For example, self-solicitation activities will not require registration if the general partner appoints a registered securities broker as a distributor in Japan and does not itself engage in any solicitation. Self-management activities will be exempt from registration if the interests in the limited partnership are acquired by one or more qualified institutional investors (QIIs) and the number of other investors who are not QIIs but have certain financial expertise is limited. Which regulations apply to the sale of a foreign investment trust in Japan depends on whether the sale is by public offering or private placement. A public offering requires the filing of a securities registration statement, which is filed and disclosed to the public via the internet, as well as an FSA statement, which is for administrative purposes and is not disclosed to the public. Public offerings of foreign investment trusts must comply with certain investment restrictions, which are intended to prevent excessively risky products that Japanese investment trusts are prohibited from investing in from being offered to the public. Such investment restrictions do not apply to foreign investment trusts sold by way of private placement. The Japanese regulations classify investment managers into two categories: non-discretionary advisers and discretionary investment managers. Non-discretionary advisory business is business providing advice on the value of securities or investment decisions based on the value of financial instruments in return for fees. Providing advice on the value of securities or investment decisions based on the value of financial instruments through newspapers, magazines or books available to the public will not fall under the scope of non-discretionary advisory business. However, the provision of advice through a website requiring readers to register as members to pay fees where that advice is not otherwise publicly available will likely fall under the scope of non-discretionary advisory business. investment management business managing assets of a collective investment scheme, which is generally a partnership (not including corporate type collective investment schemes) such as a partnership under the Civil Code of Japan, a silent partnership under the Commercial Code of Japan, an investment business limited partnership under the Investment Business Limited Partnership Act of Japan, a limited liability partnership under the Limited Liability Partnership Act of Japan or any similar foreign entity as a general partner of such collective investment scheme by investing predominantly in securities or derivatives (collective investment scheme management services). With regards to items (a) and (b), if the managed assets include real property, the investment manager is required to have a real property transaction licence under the Land And Building Transaction Act of Japan (LBTA). If the assets managed are predominantly invested in real property, the investment manager is required to have a transaction discretionary representation approval under the LBTA. In addition, the management of the assets of an investment corporation (item (a)) or an investment trust (item (c)) by investing in real property falls under the definition of 'specified investment management activities' and requires approval from the FSA under ITICA. Almost all listed J-REITs are classified under item (a) (investment corporation) rather than item (c) (investment trust). With respect to item (b), if the managed assets are invested in the beneficiary interests of a trust whose underlying assets are real property, such management is referred to as real property-related specified investment management and requires registration as a general real property investment adviser under the Real Property Investment Advisory Rules governed by the Ministry of Land, Infrastructure, Transport and Tourism of Japan (MLIT) as a prerequisite to the registration of the discretionary investment management services. In a wrap account or separately managed account (SMA), assets deposited in the SMA are managed by investing in shares, bonds or other financial instruments in accordance with the investment policy agreed from the outset. As the operators of SMAs are given the trading authority to manage an account by investing in securities, their services are classified as discretionary investment management, and the operator must be registered to provide discretionary investment management services. A non-discretionary investment adviser or discretionary investment manager located and licensed in a foreign jurisdiction may provide, respectively, non-discretionary investment advice or discretionary investment management services to a registered Japanese discretionary investment manager without requiring registration under FIEA. Investment trust management services include management of a foreign investment trust. This is intended to capture the situation where a Japanese investment manager directly manages a foreign investment trust within the scope of the investment trust management services. However, if a person conducting investment management business outside of Japan pursuant to a foreign law manages a foreign investment trust, this activity will not fall under the scope of investment trust management services, and so will not require registration under FIEA. Registration is normally required under FIEA for any person wishing to operate a non-discretionary advisory business in relation to securities or derivatives (an investment advisory business). Any individual or corporation may register to perform investment advisory business once it has met the various requirements for qualification. These include the satisfaction of certain registration requirements, for example, having in place compliance systems appropriate for an investment advisory business. Successful registration also requires the deposit of ¥5 million with the governmental deposit office. Registration further requires an investment adviser to comply with certain conduct rules, including (for example) a restriction on providing advice to customers that is designed to encourage entry into transactions that would harm their interests while promoting another customer's interests. Successful registration of an investment advisory business also gives rise to a number of administrative obligations, such as the preparation of business reports for each business year, and submission of those reports to the FSA. The investment adviser will also be required to prepare and maintain books and documents in relation to the investment advisory business. To be registered as a discretionary investment manager, a person must meet a number of requirements, including the entity requirement. Under this restriction, only a joint-stock corporation incorporated under the Corporation Act of Japan and having a board of directors and a corporate auditor or a committee, or a foreign company that is similarly organised and has a business office in Japan, is eligible to register as a discretionary investment manager. The prospective discretionary manager must also meet the minimum capital amount and net worth requirements (in each case, ¥50 million or more), and certain compliance system requirements such as a personnel structure appropriate to engage in discretionary investment management. In contrast to the requirements of an investment advisory business, the requirements for registration as a discretionary investment manager are significantly more onerous. Like a non-discretionary investment manager, a registered discretionary investment manager is subject to certain codes of conduct and is, for example, restricted from implementing investments that lead to transactions with itself, or to transactions involving any other assets managed by it. It is also required to prepare and maintain books and documents in relation to its investment management business, and prepare yearly business reports for submission to the FSA. A registered discretionary investment manager providing investment corporation asset management services or investment trust management services is also subject to certain additional obligations under ITICA, such as a duty to procure a third-party appraiser to investigate the asset value when investing in real property. A registered discretionary investment manager is in principle prohibited from engaging in any businesses other than financial instruments transactions, in order to insulate the discretionary investment management business from risks unrelated to financial instruments transactions. That said, a registered discretionary investment manager is permitted to engage in certain businesses that are ancillary to financial instruments transactions, such as M&A advisory and business consulting. On making further filings with the regulator, a registered discretionary investment manager will be permitted to engage in certain other businesses, such as commodities-related business, money lending and real property brokerage. Solicitation by an issuer of certain securities, including units of a Japanese or foreign investment trust, or interests in a Japanese or foreign collective investment scheme, such as Japanese silent partnerships or foreign limited partnerships, is regulated as self-solicitation under FIEA. An issuer of a Japanese or foreign investment trust or collective investment scheme who solicits for its own securities is in principle required to be registered as a Type II financial instruments transaction business. However, if it retains a distributor for the securities it issues, and does not make any solicitation itself, no registration will be required. The issuer of a Japanese investment trust is the trust settlor, and in that capacity it will also act as the trust manager. How the issuer of a foreign investment trust will be classified will depend on the applicable governing law and documents. If a foreign investment trust is established by a bilateral trust deed between the manager and the trustee, and the governing law or document provides that units of the trust are issued by the manager, the manager will be the issuer of the investment trust. As a result, this will amount to self-solicitation, and the issuer will need to be registered on that basis to offer its own securities in Japan. If a foreign trust is established by a unilateral declaration of trust by the trustee, the trustee will be the issuer. To avoid the registration requirement of self-solicitation, the issuer (who is the manager or the trustee, as the case may be) must have a Japanese distributor, and not engage in any solicitation itself. In collective investment schemes, the managing partner or general partner of a Japanese or foreign limited partnership, or the business operator of a Japanese silent partnership, will be the issuer of the securities. Management of assets by operators of certain funds, including Japanese or foreign collective investment schemes, is regulated as self-management under FIEA, and requires registration to offer collective investment scheme management services if the fund invests more than 50 per cent of its assets in securities or derivatives. Typical examples of such collective investment schemes are Japanese or foreign limited partnerships and Japanese silent partnerships. Prior to the enactment of FIEA, which replaced the Securities and Exchange Act of Japan in 2007, management of assets by such fund operators was regarded as management of the operator's own assets, and was outside the scope of the regulation. However, the FIEA regulations, having been extended to catch such management activities by fund operators, now recognise this as management of investors' assets. The registration requirements for carrying out a Type II financial instruments transaction business (in cases of self-solicitation) and discretionary investment management (in cases of self-management) are waived if the QII exemption under FIEA is available. The QII exemption is available if the investors of a collective investment scheme together consist of at least one or more QIIs and up to 49 non-qualified institutional investors. Where the QII exemption is used to avoid registration as a Type II financial instruments transaction business, additional transfer restrictions apply so that the QIIs are prohibited from selling their interests in the collective investment scheme to non-qualified institutional investors, and are prohibited from selling their interests other than by selling their interests as a whole. The rationale for this exemption is that a QII usually has enough financial expertise and bargaining power against fund managers to prevent the latter from setting up and managing a fund that is one-sidedly disadvantageous to the investors. A QII under the QII exemption is expected to monitor the fund manager on behalf of the non-QIIs. To take advantage of the QII exemption, a filing with the regulator needs to be made in advance. In the case of self-solicitation, the issuer of the collective investment scheme will make this filing, while in the case of self-management, the manager of the collective investment scheme will make the filing. The issuer or the manager (as the case may be) will normally be the general partner in the case of a limited partnership, or the business operator in the case of a Japanese silent partnership. The filing document can be prepared in English. QIIs include banks, insurance companies, securities companies and other operators carrying out financial instruments transaction business. Business corporations can be recognised as QIIs if they have securities investments greater than ¥1 billion and make an additional filing with the FSA. The QII exemption has been widely used, not only for domestic collective investment schemes, such as nin-i kumiai partnerships and tokumei kumiai (TK) partnerships, but also for foreign partnerships. However, it has been occasionally abused by putting in a sham QII, such as an affiliate of the general partner or another investment partnership managed by the general partner, which could not be expected to monitor the general partner. FIEA was amended, and the requirements for the QII exemption were strengthened, effective 1 March 2016. This amendment has a grandfather period for some of the new requirements, where collective investment schemes existing as of the effective date are given a six-month period to comply with the new requirements. persons closely related to QII-targeted fund operators, including directors, employees, parent companies, subsidiaries and affiliates of QII-targeted fund operators. This investor qualification requirement is relaxed as to venture funds investing 80 per cent or more of their investment assets in non-listed corporations. Among others, directors, employees with professional capabilities who are indispensable to the business and consultants, all of which are engaged in the establishment of the company, issuance of equity securities, and the inception of a new business or initial public offering, are also able to invest under the QII exemption as non-QIIs. QIIs who may invest under the QII exemption are also limited in order to prevent the abuse of the exemption by creating a sham QII. Limited liability investment partnerships with investment assets of less than ¥500 million (less the amount of borrowings) and subsidiaries of QII-targeted operators no longer qualify as QIIs under the amended QII exemption. The contents of the filing document have been enhanced. Among others, the names of the QIIs that invest under the QII exemption must be stated in the filing document. If a fund operator is a foreign entity, it is required to appoint a representative in Japan. Such representative in Japan is supposed to act as a contact with regard to the regulator. Certain information in the filing document is disclosed to the public by the regulator, including the number (but not the names) of the QIIs. Fund operators using the QII exemption are required to file annual business reports within three months from the end of each fiscal year. In addition, starting on the day after the four-month period following each fiscal year, fund operators are required to make available to the public for one year the annual business report or, in lieu thereof, a separately prepared disclosure document. Fund operators may de-register their QII exemption if they no longer solicit investors in Japan through self-solicitation; and the number of Japanese investors and the volume of the investment from Japan in terms of amount are relatively small, and the exception to self-management for foreign collective investment schemes (described below) is available. When a fund operator deregisters its QII exemption, it will be released from the obligations under a QII exemption, including periodic filing and disclosure requirements. If a general partner or similar entity of a collective investment scheme delegates its entire investment authority to a discretionary investment manager, the management activity of that general partner or similar entity will be excluded from the scope of collective investment scheme management services, and registration as a discretionary investment manager will not be required. Where investments from Japan to a foreign collective investment scheme are limited, the management activity of the general partner or similar entity of the foreign collective investment scheme is excluded from the scope of the collective investment scheme management services (limited Japan relationship exception). Specifically, the following requirements must be met: Japanese investors directly or indirectly investing in the foreign collective investment scheme are QIIs only; the number of such Japanese investors is less than 10; and the total contributions from such Japanese investors are less than one-third of the total contributions of all investors in the collective investment scheme. For a foreign investment trust to be publicly offered in Japan, the foreign investment trust needs to satisfy certain requirements set out by JSDA, a self-regulatory body of securities companies acting as distributors in the context of foreign investment trusts. A member of JSDA cannot engage in a public offering of a foreign investment trust that does not satisfy the JSDA requirements. Most of the JSDA requirements do not apply to a private placement of a foreign investment fund, and thus members of JSDA may engage in such private placements. credit concentration risks borne by the fund are managed in accordance with a reasonable method set in advance by the management company or the investment manager. This requirement was introduced on 1 December 2014. A grandfather arrangement exists whereby the requirement does not apply for a period of five years to existing funds publicly offered in Japan prior to 1 December 2014. When a foreign investment trust is a master feeder fund and a feeder fund is publicly offered in Japan, the question arises as to whether the JSDA requirements will be applicable only to the feeder fund or also to the master fund – in other words, whether the feeder fund will be looked through to consider the master feeder fund as well. Currently, the general practice is to apply the JSDA requirements to the feeder fund only, and not to look through it to the master fund. The exception to this is the credit concentration restriction, which cannot be complied with unless one looks through the feeder fund to the master fund because all of the feeder fund's assets are invested or concentrated in the master fund. The issuer of a foreign investment trust (i.e., the management company of the fund) must file a securities registration statement with the regulator in advance via EDINET, a web-based disclosure system managed by the FSA. The securities registration statement is a disclosure document under FIEA of securities that are publicly offered in Japan and is disclosed to the public through the internet. Once filed, the securities registration statement becomes effective after 15 clear days. Solicitation of investment into the securities can be made before the securities registration statement becomes effective, but execution of the investment cannot be made until the securities registration statement becomes effective and a mandatory prospectus is delivered to the investor. The prospectus of an investment trust consists of a mandatory prospectus and a prospectus upon request. The contents of the prospectus upon request are substantially similar to those of the securities registration statement with minor adjustments and omissions. The mandatory prospectus is a summary of the prospectus upon request. The mandatory prospectus needs to be delivered to investors on or prior to execution of the purchase of the securities. The prospectus upon request is delivered to investors only where specifically requested by investors. Pursuant to ITICA, the issuer of a foreign investment trust that is publicly offered in Japan must file an FSA statement with the FSA immediately before the securities registration statement becomes effective. Most of the contents of the FSA statement overlap with those of the securities registration statement and as a result, the FSA statement is usually prepared by reprocessing the necessary information from the securities registration statement. The FSA statement is for administrative purposes only, and is not disclosed to the public. Private placement of securities in Japan is classified into two categories (minor variations aside): private placement to QIIs only and private placement to small numbers of investors. In a private placement for QIIs only, investors are limited to QIIs. There is no limit to the number of QIIs who may invest in a private placement. QIIs are, however, prohibited from selling on their securities to non-QIIs. In a private placement to a small number of investors, the number of investors in a private placement is limited to 49. The investors are prohibited from selling their securities unless they are transferring their securities to a single investor as a whole. This restriction ensures that the cap on the total number of investors is not breached. Neither a securities registration statement nor a prospectus is required if a foreign investment trust is offered in Japan by way of private placement. However, an FSA statement needs to be filed even for the purposes of a private placement before any solicitation of investment is made in Japan. While an FSA statement in a public offering is filed after the securities registration statement is filed (i.e., where solicitation has begun but before the securities registration statement becomes effective), the FSA statement in a private placement must be filed prior to any solicitation in Japan. A solicitation made in Japan by the issuer of a foreign investment trust (in the case of a bilateral trust deed type unit trust, the manager, or in the case of a unilateral declaration of trust type unit trust, the trustee) is regarded as self-solicitation under FIEA and requires registration as a Type II financial instruments transaction business (see Section II.iv). If a distributor is appointed in Japan (usually a securities company) and the issuer of the foreign investment trust does not engage in any solicitation, this registration requirement is not triggered. It may be that a Japanese investor, usually a sophisticated institutional investor, approaches a foreign investment trust without any solicitation made in Japan by the foreign investment trust and makes an investment in the foreign investment trust. In such cases (sometimes referred to as 'reverse marketing'), an FSA statement of the foreign investment trust is not required on the basis that there has been no solicitation in Japan. It is a matter of fact as to whether there has been any solicitation in Japan; however, it should be stressed that if a foreign investment trust has any involvement in Japan through a subsidiary, or an affiliate or representative office, there may be a risk that the activities of such entities are regarded as soliciting investment in the foreign investment trust. For retail or institutional investors seeking a diversified portfolio investment in shares and bonds, Japanese and foreign investment trusts are commonly used. For retail investors, investment trusts are sold through public offerings. The Investment Trust Association of Japan (ITAJ) is a self-regulatory body of Japanese investment managers engaging in the management of investment trusts, and sets out certain requirements that publicly offered Japanese investment trusts must satisfy. The ITAJ requirements are quite similar to the JSDA requirements that foreign investment trusts that are publicly offered in Japan must satisfy. Publicly offered Japanese investment trusts and publicly offered foreign investment trusts are intended to stand on an equal footing through the ITAJ requirements and the JSDA requirements. There are two ways to bring a foreign investment trust to Japan for public offering. One is to directly make a public offering of the foreign investment trust. The other is to set up a Japanese investment trust that will invest in the foreign investment trust. There are certain complications with the latter approach. A publicly offered Japanese investment trust is generally restricted from investing in a foreign fund of funds under the ITAJ rules. As such, if the foreign investment fund to be brought into Japan is a fund of funds, it will not be possible to use a Japanese investment trust as a feeder fund. In addition, a Japanese investment trust acting as a fund of funds is generally required to make investments into multiple funds. When a foreign investment trust is brought into Japan through a Japanese investment trust as feeder fund, the feeder fund therefore invests a small portion of the fund's assets into a money management fund to satisfy this diversification requirement. This investment aside, the remainder of the feeder fund's assets will be invested in the foreign investment trust. For institutional investors pursuing a diversified portfolio investment in shares and bonds, Japanese or foreign investment trusts are usually sold through private placements. A private placement of a foreign investment trust will still require an FSA statement to be filed in advance (see Section II.v). For retail or institutional investors who wish to have a portfolio investment in real property, J-REITs are commonly used. Shares in many J-REITs are listed on Japanese securities exchanges. The number of privately placed J-REITs whose shares are not listed has recently been increasing. For regulatory issues relevant to J-REIT investment managers, see Section II.v. For PE investments, limited partnerships in Japan and in foreign jurisdictions such as the Cayman Islands or Delaware are commonly used. For institutional investors who want to invest in relatively limited real properties, a TK-GK scheme on a private placement basis is common. The term TK-GK refers to a silent partnership under the Commercial Code of Japan, where an investor makes a financial contribution to an operator and the operator conducts business under its own name. The identity of the TK investor is not disclosed to third parties who engage in transactions with the TK operator. A TK is a pass-through entity, where the TK itself is not a taxable entity in respect of profits generated from the TK business, and profits and losses are allocated to the TK investor and taxed at the TK investor level. A GK is a corporation under the Corporation Act of Japan that is similar to a limited liability company in foreign jurisdictions in that it exhibits some of the features of both a partnership and a corporation. However, unlike a limited liability company in other jurisdictions, a GK is not a pass-through entity. When investing in real property, a TK-GK cannot directly invest or hold real property for regulatory reasons. Accordingly, a TK-GK will invest in trust beneficiary interests, the underlying assets of which are real property. Trust beneficiary interests are securities under Japanese law; thus, a TK-GK investing in real property trust beneficiary interests is subject to regulation under FIEA. Foreign or Japanese limited partnerships and TK-GK are collective investment schemes under FIEA. See Section II.iv, for the regulatory issues affecting collective investment schemes under FIEA. TMKs are also common as investment vehicles for institutional investors who are seeking a limited and tailored portfolio of loans and real property. A TMK is a specified purpose company used for the securitisation of assets, including loans and real property. TMKs are pay-through entities where, if more than 90 per cent of the profits are distributed to the TMK's investors (i.e., preferred shareholders), such amount is deducted as an expense from its corporate income. A TMK is able to directly hold real property, as well as real property trust beneficiary interests. Japanese pension funds remain the dominant investors in the Japanese asset management market, despite the notorious 2012 AIJ scandal (see Section VI.ii). According to surveys by the Japan Investment Advisers Association, the total amount of Japanese pension fund assets under discretionary investment management by Japanese investment managers as of March 2018 was approximately ¥139 trillion, an increase of approximately ¥13 trillion from the previous year. In comparison, the total amount of assets under discretionary investment management by Japanese investment managers as of March 2018 was approximately ¥196 trillion. Foreign investors, including foreign institutional investors and offshore funds, are also important investors for Japanese investment managers, with total foreign investor assets under discretionary investment management amounting to ¥48 trillion as of March 2018. Variable insurance operates similarly to an investment trust. In variable insurance, the insurance premiums are managed by investment in shares, bonds and other assets, and the insurance proceeds and termination repayments depend upon the performance of the investments. While the costs associated with variable insurance are relatively higher than those of regular investment trusts, variable insurance remains a key investment alternative due to certain advantages it provides. For example, the insurance premiums of variable insurance are tax-deductible (subject to certain limitations). As variable insurance does not provide for distributions to investors during the investment period, tax that would be imposed on the distributions of an investment trust is deferred until the payment of insurance money or termination of the insurance. If an heir is designated as payee of the insurance money, the heir is able to enjoy an estate tax exemption of up to ¥5 million per heir. In light of their similarity to investment trusts, certain regulations dealing with the marketing of investment trusts under FIEA apply mutatis mutandis to the marketing of variable insurance. Among other requirements, an explanatory paper must be delivered to a purchaser of variable insurance on or prior to execution of the contract. Items to be described in this explanatory paper are similar to those required by a prospectus prepared in respect of an investment trust. While the distributors' fee for investment trusts must be disclosed to investors, the distributors' fee for insurance products is not required to be disclosed. The FSA sees this as a problem and, as a result of the strong pressure it applied, in October 2016, mega-banks and many regional banks began to voluntarily disclose the distributors' fee for certain insurance products that have the nature of investment products, such as variable insurance. Scenario (d), in which a pension fund manages itself, is called in-house management, and is permitted only for pension funds equipped with sufficient human resources. When the assets of a Japanese pension fund are managed by a discretionary investment manager under (c), the pension fund must also enter into a trust agreement with a trust bank under which the pension fund entrusts the managed assets to the trust bank. The management authority over the trust asset is then delegated to the discretionary investment manager. This arrangement is necessary because discretionary investment managers are prohibited from being entrusted with managed assets. In the AIJ case that came to light in 2012, the discretionary investment manager, AIJ Investment Advisory Co, Ltd, entered into discretionary investment management agreements with a number of pension funds and invested the managed assets heavily into a Cayman unit trust managed by its affiliate. The assets of the pension funds were entrusted with Japanese trust banks that held units of the Cayman unit trust. The discretionary investment manager and its affiliated manager of the Cayman unit trust manipulated the net asset values (NAVs) of the Cayman unit trust for a long period of time. The total loss of the pension funds reportedly amounted to approximately ¥200 billion. The registered unitholder of the Cayman unit trust was a securities company acting as the distributor of the unit trust in Japan, which was reportedly also affiliated with the discretionary investment manager and failed to forward the correct information received from the trustee or administrator of the Cayman unit trust to the trust banks and the pension funds. Following the revelations in the AIJ case, regulations surrounding asset management of pension funds have been tightened. Among other measures, trust banks acting as trustees of a pension fund's assets are now required to take measures to ensure they are able to directly access NAVs and the audited reports of funds to which they act as trustees. Pension funds are also required to set out rules regarding investment diversification, which is encouraged in order to avoid concentration in a limited number of products. For retail and institutional investors who wish to have a large and diversified real property portfolio, real estate investment corporations or J-REITs are commonly used. J-REIT investment managers must have a real property transaction licence and an approval of transaction discretionary representation under the LBTA, and must be registered for discretionary investment management (see Section II.ii). Investment managers to TK-GK structures, which are preferred by institutional investors looking for relatively limited and tailored real property portfolios, are required to hold a real property transaction licence under the LBTA, a registration as a general real property investment adviser under the Rules for Registration of Real Properties Advisory Businesses (which are not laws or regulations, but notices issued by the MLIT), and a registration of real property-related specified investment management, a subcategory of discretionary investment management services. The rationale behind hedge fund regulation is to protect investors in light of the complexity and high risks associated with hedge fund products, and to protect the stability of financial systems. The latter point arises as it is felt that hedge funds, which are significantly sized entities, have complicated investment techniques and are closely integrated with financial systems, pose a potential systemic risk if not appropriately regulated. Regarding the protection of investors, hedge funds are subject to the same regulations applicable to other financial products. For example, if a hedge fund is structured as a collective investment scheme, or a Japanese or foreign limited partnership, the marketing of the hedge fund in Japan by its manager will be treated as self-solicitation and require registration as a Type II financial instruments transaction business (unless the QII exemption is available); and the management of a hedge fund by its manager will be treated as self-management and require registration as a discretionary investment management business (unless the QII exemption or the limited Japan relationship exception is available). Currently, no hedge fund-specific regulations exist that attempt to maintain financial system stability. Both partnerships under the Civil Code of Japan and investment business limited partnerships under the Investment Business Limited Partnership Act are commonly used for private equity funds. These partnerships are treated as collective investment schemes and are subject to the same regulations on marketing (self-solicitation) and management (self-management). A summary of the general taxation system of Japan currently in effect in relation to investment funds and other asset management activities is discussed below. Tax treatment may vary according to the type of investor and fund, and other factors, and may be affected by subsequent changes in any relevant tax laws or tax authority decisions. A securities investment trust and a publicly offered investment trust will not be subject to taxation with respect to any profits gained through the management of the trust property. A securities investment trust is an investment trust that invests more than 50 per cent of its assets in securities based on the instructions of the settler. In the case of investment trusts other than securities investment trusts and publicly offered investment trusts, the trustees, rather than the trusts themselves, will be subject to corporation tax with respect to profits gained through the management of the trust property. Investment corporations will, in principle, be subject to corporation tax with respect to profits gained through the management of assets. However, if an investment corporation meets certain requirements, any distribution will be treated as a loss when calculating the investment corporation's income for the business year. As a result, the tax imposed on profits can be minimised. The requirements referred to above include that the investment corporation's issued equity is held by 50 or more investors, or by financial institutions only; the amount of its equity interests solicited in Japan exceeds 50 per cent of the total amount thereof; and distributed amounts in a single business year exceed 90 per cent of the total amount of the investment corporation's distributable profits in that business year. Partnerships, silent partnerships, investment limited partnerships and limited liability partnerships are not subject to taxation. However, the relevant entity's partner will be subject to taxation with respect to profits gained through the management of assets thereof. Under Japanese tax laws, a foreign entity similar to the above will not, in principle, be subject to taxation with respect to profits gained through the management of assets thereof. Recently, however, the Supreme Court of Japan ruled that Delaware limited partnerships should be classified as corporations for tax purposes. This is the first Supreme Court decision to established criteria for foreign entity classification. The Court explained that to determine if an entity is a corporation for tax purposes, one needs to consider if the entity has the legal attributes of a separate taxpayer, focusing on the rights and obligations relating to the entity's activities. The Court said that the first question is whether the entity is clearly defined under the law of incorporation as a corporation, or simply as an aggregate of its members. The second question is whether the entity can separately have a proprietary interest in its assets, and be liable for debts and obligations incurred as a result of its legal acts under the law of incorporation. Where an entity is deemed to be a foreign corporation, the entity's partners may not deduct the entity's losses from their tax returns. An investment manager that is a corporation will be subject to corporation tax, and an investment manager who is an individual will be subject to income tax, with respect to any management fees or similar compensation received. A non-resident investor or a foreign corporate investor (an overseas investor) will currently, in principle, be subject to income tax or corporation tax as follows with respect to income obtained from sources within Japan. An overseas investor investing in an investment trust will be subject to income tax at a rate of 15.315 per cent with respect to distributions made by an investment trust. In addition, overseas investors investing in investment trusts will be subject to income tax or corporation tax at a rate of 15.315 per cent with respect to capital gains from cancellation or redemption of beneficial interests. These tax rates may be affected by relevant tax treaties. Currently, an overseas investor investing in an investment corporation will be subject to income tax at a rate of 15.315 per cent with respect to distributions made by the investment corporation. In addition, a non-resident individual investor having no permanent establishment in Japan will not be subject to income tax with respect to capital gains arising from the transfer of an equity interest (except in certain limited cases, such as a transfer of shares of real estate-related corporations). Even where a non-resident individual investor is subject to income tax with respect to capital gains arising from the transfer of an equity interest, the tax rate may be affected by a relevant tax treaty. Under Japanese tax laws, an overseas investor investing in a partnership, investment limited partnership or limited liability partnership will be subject to income tax at a rate of 20.42 per cent with respect to distributions of profits thereof if such investor is deemed to maintain a permanent establishment in Japan by the relevant tax authorities. The tax rate may be affected by a relevant tax treaty. However, in the case of an investment limited partnership, if an overseas investor meets certain requirements (including that such investor is a limited partner and is not the direct executor of the business of the investment limited partnership), the investor may be deemed not to maintain a permanent establishment in Japan if it files an application on this basis with the tax authority. An overseas investor investing in a silent partnership, with or without a permanent establishment in Japan, will be subject to income tax at a rate of 20.42 per cent with respect to distributions of profits thereof. Given that the portion of household finances allocated by Japan households to investments (including shares, bonds and investment funds) is pretty small compared with other developed countries, and that most of those finances are disproportionately allocated to cash and bank deposits, the 'from savings to investments' policy is expected to continue. To encourage households to increase their investments, financial institutions, including asset managers and distributors, are encouraged by the FSA to adopt their own policies regarding customer-oriented business conduct. Financial institutions are also urged to compete with each other in reshaping their business practice in order to best serve their customers. Under the prolonged low-interest policy of the Bank of Japan, Japanese banks, especially regional banks, have been seeing a decline in their profits from their core lending business and are struggling to survive. This development will encourage them to be more active in the distribution business of investment funds, which remains profitable. The ARFP was originally expected to take effect in the first half of 2018, and Japan and Thailand have completed domestic arrangements for the ARFP. However, there has been no active moves among Japanese asset management companies or distributors to utilise the ARFP, although their official statement on the matter is that they are internally examining or preparing for it. As it is relatively easy to import foreign-domiciled funds into Japan even without the ARFP, it is likely that the use of the ARFP in importing foreign funds into Japan remains marginal. 1 Yasuzo Takeno is a partner and Fumiharu Hiromoto is of counsel at Mori Hamada & Matsumoto. 2 'Japan Revitalisation Strategy' (Revised 2014) (Cabinet Decision of 24 June 2014). 3 On 23 July 2018, a Japanese newspaper reported that there was a miscalculation in the amount of investment funds held by Japanese households, which was disclosed in the statistics of the Bank of Japan. According to the report, the amount of investment funds held by Japanese households as of 31 December 2017 should have been ¥76.4 trillion, as opposed to ¥109.1 trillion, with this miscalculation coming from the incorrect treatment of the assets held by Japan Post Bank Co, Ltd. If the report is correct, the total amount of net assets held by Japanese domestic investment funds for public offer is much smaller, and the trend of 'from savings to investments' has not progressed as much as was thought based on the Bank of Japan statistics. 4 FSA, notice of 28 April 2016 'Signing of Asia Region Fund's Passport's Memorandum of Co-operation'. 5 FSA, Highlights of the Financial Monitoring Policy for 2014–2015, September 2014. 6 FSA Financial Monitoring Policy for 2014–2015 (Policy for Supervision and Inspection) September 2014.